Do we look like the real thing–or what? Not since my childhood days when every costume came in a box with a cellophane lid so you could see the mask and decide if that was the costume for you. And I’m pretty sure, no matter what costume you chose–cowboy, witch, princess or maniacal clown–it was made of some cheesy, flammable cloth that came in only size and was guaranteed to make you look like something the cat ate. For years, I wore the same Snow White costume with the kind of mask that totally blocks your vision. I’d go out trick or treating, but thanks to the mask, I couldn’t see two feet in front of me. For all I knew, I was walking around in circles, hitting up the same three houses for candy. No wonder I ended up with so many of those stinky Mary Jane’s. Did anyone really eat those things anyway? In college, I threw a Halloween party with my then boyfriend. We decided to dress as Mickey and Minnie. No boxed costumes this time. We made our own, using clothing we already owned. Suffice it to say, we looked pitiful. Like Minnie and Minnie had fallen on hard times. No one could guess who we were supposed to be, and the experience traumatized me so much that I never wore another costume again. For as long as I can remember, my workplace has been throwing an annual Halloween party. A lot of people dress up and are very creative, coming up with all sorts of ingenious costumes. In fact, we hold a costume contest and each year the competition seems to get tougher. I usually dread this party. Mostly because when it comes to costumes, I’m all thumbs. For starters, I can’t sew, not so much as a button or a hem. Besides, I don’t have one iota of creativity when it comes to conjuring up a clever costume. Which is why, long ago I gave up on the notion of costumes. 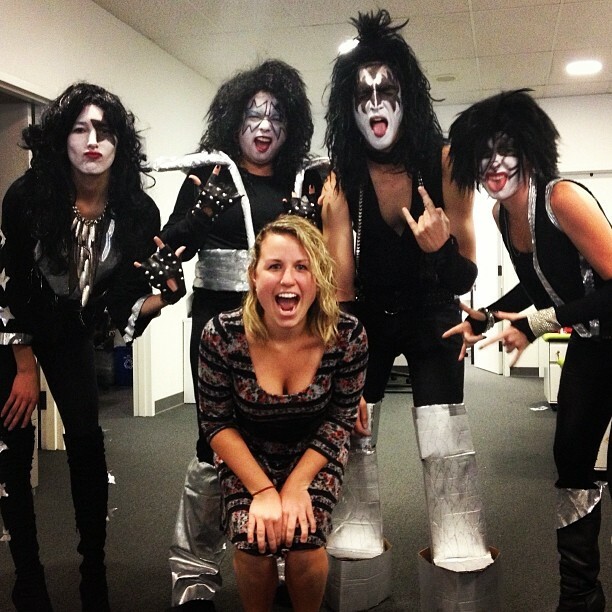 Hayley couldn’t join us, but she helped us get into Kiss mode. 1. They’d need to come up with the idea for the costume and tell me exactly what I’d need to provide. 2. Any sewing or application of special makeup would not be done by me. Sewing brings up too many nightmares of home-ec class, after all. It was decided we’d go as Kiss, everyone’s favorite mime, I mean, rock band. Sean, our newest staff member, rounded out our group, and Hayley, who couldn’t make the staff party, cheered us on and helped us get ready. For nearly two weeks, Clare and Ashley searched high and low for the necessary accoutrements for the costumes, visiting thrift shops, swap meets, fabric stores, and when all else failed, by going online. Clare, who is the queen of crafts, knows her way around a sewing machine. She took measurements and made the clothing essentials that helped complete our look. On Halloween day we commandeered one of the conference rooms in order to get ready. Which mostly meant applying our makeup, and putting on our wigs and costumes. We had to do this all in secrecy so as not to give away our group costume ahead of time. But you can only hide so much when you’re at the office, and as soon as we walked out of the conference room, we were bombarded by the, ahem, “paparazzi,” better known as our fellow colleagues, who were rather thunderstruck to see me in costume. Needless to say, it was rather fun posing in rock star mode. The real Kiss. Can you tell the difference? Bottom line: We rocked the house! Plus, I had a blast in my getup and was thrilled when we won the contest. Best group costume, indeed! So maybe dressing up for Halloween is not my thing. Or maybe it is. I for one, hope we do it again next year. What would we dress as? Hmm. I think Clare and Ashley have already started brainstorming but just in case, got any suggestions? So how was your Halloween? Did you and your family dress up? Do tell! My girls went as Monster High dolls – one was Frankie-stein and the other was Dracu-Laura… ah! the brilliant marketing of these dolls. We did improvise on some things but as I cannot sew, hem or pull anything together, the costumes needed to be fairly simple. We did end up buying for one and making it up for the other. They went with friends and the adults had fun. Deborah, you’re right. Halloween is embedded in our culture. Amazing!! Your team looked fantastic, truly. Agree with all the comments, hard to see the difference. What a great look. I can just imagine the looks your got walking into Starbucks or the market on your way to and from work. What a sight to behold. Lordy, lordy, you really did this!? You all deserve a prize for best look alike, best costumes, best make up, most spirited and your temerity! Goodness gracious, I can’t tell the difference between your group and the real one! Congratulations! Everyone will remember what costume and who won in ’13. I kind of went into it “kicking and screaming,” but pretty soon, I got into it. As long as there were others willing to do the work, how could I refuse? I kind of liked seeing all those shocked faces at the Halloween party when they realized I was decked out in all my Kiss regalia. At least one person said, in all my 18 years of not wearing a costume at the staff party, I was the last one they expected to see in one. And a Kiss costume at that! Sigh. You all look awesome! So glad you let your playful out for this one. I love Halloween, my favorite though I haven’t played dress-up in many years. Val, if you had told me in September that I’d be dressing up for Halloween, I would’ve said, not in a million years. Go figure. 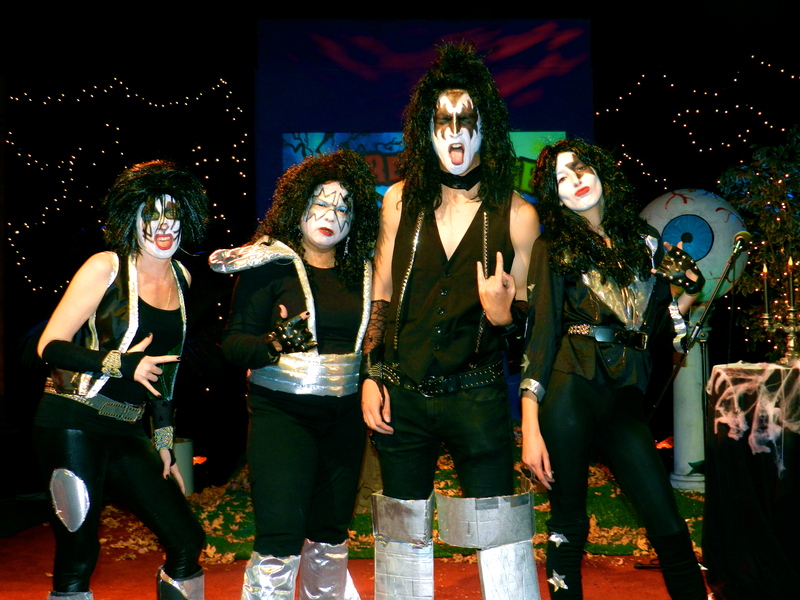 Love that you dressed up as Kiss and won the group prize. Sara and I had dinner at a friend’s house on Halloween, followed by a viewing of American Horror Story. I suggested I wear blue and Sara wear black–that we could go as a bruise. Sara declined. Oh, well, there’s always next year! Oh, it’s too bad Sara didn’t want to be a bruise! But that raises a question, do they show any American TV over there, but in English? When I lived in Venezuela, in my youth, there was a lot of American programs, but it was all in Spanish, so I didn’t really watch. I didn’t like the phony voices. I remember watching “Bewitched” in Spanish and everyone spoke in super quickly in a lilting Spanish voice. It annoyed the heck out of me, especially since I remembered what their actual voices sounded like. It was probably the only year in my life that I didn’t watch much TV. I’m with you on the not sewing and dressing up. It sounds like this is the ideal compromise. Hope the gang comes up with something equally brilliant next year! Your group ROCKS, Monica — congrats on winning the costume contest! I didn’t dress up on Halloween. Like Robert ^, it’s not my favorite holiday. But I truly admire folks who know their way around a sewing machine, ones who can dream up costume ideas and carry them out! Oh, and I love your leafy background here! Love it! You look fabulous. Rock on sista! Thanks, Becky! Right back atcha! You guys deserved to win, Monica. The costumes are fabulous! I’m so glad you caved in and joined the group. How fun! Wow. You guys look like you could rock and roll all night and party every day!! Outstanding. I heard my favourite KISS song, Beth, on the radio today – so this just rounds out my day nicely. Good for you! I have been known to dress up for Halloween even to give out treats. As a mother of three teenagers now, the request (plea?) was that I NOT dress up at all. I’ll give them this year as a by (but will be back with a vengeance next year!)!! That’s fantastic, Astra. You show them what you’re made of and do it big and do it in style! Be sure to let us know how it goes! You looked fabulous! Congrats on the win. I rarely dress up, but when I do, it’s so much more fun to have a group costume. I think there’s safety in doing it as a group. Like, we’re in this together. Plus, it meant I didn’t have to fret over the costume and left it to the pros to come up with something spectacular. And it was! I am lost for words Monica, but pleased you had a great time…. Not a fan of Halloween I must admit, as I think I said before on a previous post you did on the subject, here the kids treat it as little more than legalised begging. Hope you weren’t too disappointed. Sometimes it’s okay to let your hair down a bit and go with the flow. In the end, it’s moments like these that keep you young. Oh I am all in favour of moments that help keep us young. I am not really a fan of dressing up and the like though and it would take some pretty fast talking to get me involved. I am happier in the background I think. Dodged the trick or treaters as we were out at the hospital visiting mum. I didn’t dress up Monica, but I had an ultrasound and not the kind that requires a full bladder. Surely that was scary enough. Yikes! Love your creativity though. Dressing up is so much fun. Hope everything’s okay, Renee. Not having to have a full bladder makes all the difference, so I hope the results were what you were looking for. So awesome! I love when we allow ourselves to be free and then have a blast doing it! I donned my graduation robe for my daughter’s halloween dance. Not too creative, but the week was so busy and that was the best I could do!